The Panama Deception documents the untold story of the December 1989 U.S. invasion of Panama; the events which led to it; the excessive force used; the enormity of the death and destruction; and the devastating aftermath. The Panama Deception uncovers the real reasons for this internationally condemned attack, presenting a view of the invasion which widely differs from that portrayed by the U.S. media and exposes how the U.S. government and the mainstream media suppressed information about this foreign policy disaster. 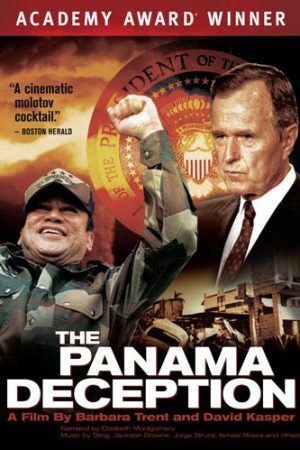 The Panama Deception includes never before seen footage of the invasion and its aftermath, as well as interviews with both invasion proponents like Gen. Maxwell Thurman, Panamanian President Endara and Pentagon spokesperson Pete Williams, and opponents like U.S. Representative Charles Rangel (D-NY. ), Panamanian human rights workers Olga Mejia and Isabel Corro and former Panamanian diplomat Humberto Brown. Network news clips and media critics contribute to a staggering analysis of media control and self censorship relevant to any news coverage today, particularly during times of war. It was Aldous Huxley who stated in his book Brave New World that “one believes things because one has been conditioned to believe them.” This still rings through, especially in a day and age when we are constantly being bombarded with information and we have no way of proving if any of it is true. On the tenth anniversary of the terrorist attacks of September 11th, 2001, expert witnesses gathered at Ryerson University in Toronto, Canada to provide evidence-based research that basically opposed the official story of what took place on that fateful day. Pete Weber calls himself the best in the world because he believes he is. He was inducted to the Bowling Hall of Fame in 1998 and holds 37 career titles. Generation OS13 is an explosive insight into the attack on civil liberties occurring in western democracies and how artists, musicians, journalists and authors encourage the peoples right to resist against Banker occupation. Nazi Concentration Camps was entered as evidence at the 1945 Nuremberg Trials of Rudolf Hess, Hermann Göring, and 22 other Nazi officials in the aftermath of World War II. Many famous name brands deliberately choose to manufacture their products in countries where labor is cheap. This comes at a high cost that usually involves human rights violations and abuse of power. Starsuckers is a feature documentary about the celebrity obsessed media, that uncovers the real reasons behind our addiction to fame and blows the lid on the corporations and individuals who profit from it. Produced by Carl Christman, “Freedom Fries and Other Stupidity We’ll Have to Explain to Our Grandchildren”, explores the phenomenon of “hollow patriotism” that has been occurring for some time in the U.S. In the 19th Century, Jay Gould, an American railroad developer was quoted as saying “I can hire one-half of the working class to kill the other half.” In the days when thousands of men worked in the mines, each mining camp was under the dominion of the company and had a law enforcement officer who was on the pay roll.